Walsh appreciated the opportunity to attend and participate in this event. We have sponsored the event for the last three years and we have found it to be very informative; there is no better vineyard business event to attend. We look forward to supporting the Symposium Group's efforts in the future. 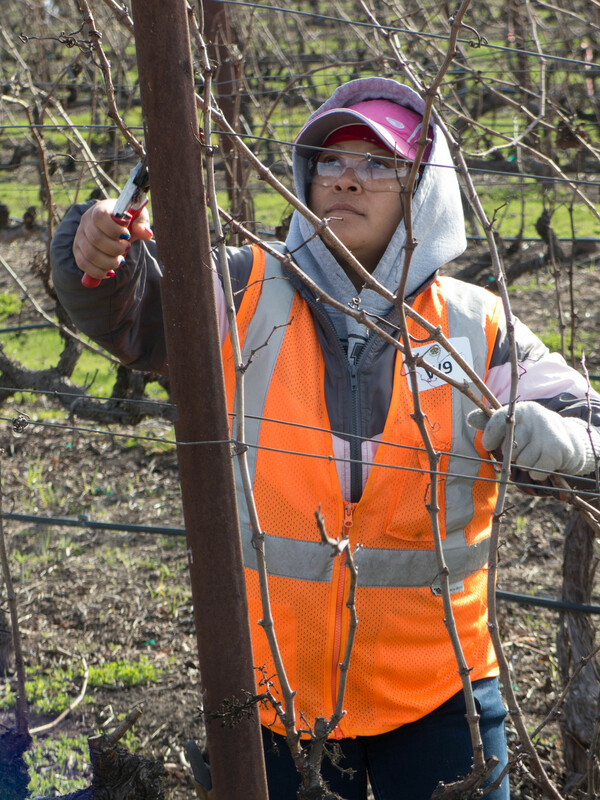 Napa Valley Grape Grower 2014 Pruning Award Winner Maria Romero of Walsh Vineyards Management prunes a vine with precise quality. The annual dormant pruning of vineyards on the North Coast has great impact on the growing season. The pruning task is made up of two main operations: pre-pruning and pruning. Pre-pruning is used to help spread out field work (with the result being more sustainable "year round" employment for staff), control total pruning costs, and allow for disease management. In limited situations, late pre-puning can facilitate a later bud break, resulting in passive frost protection. We covered this in an earlier post. Pruning is done after pre-pruning and will help determine yield and quality. 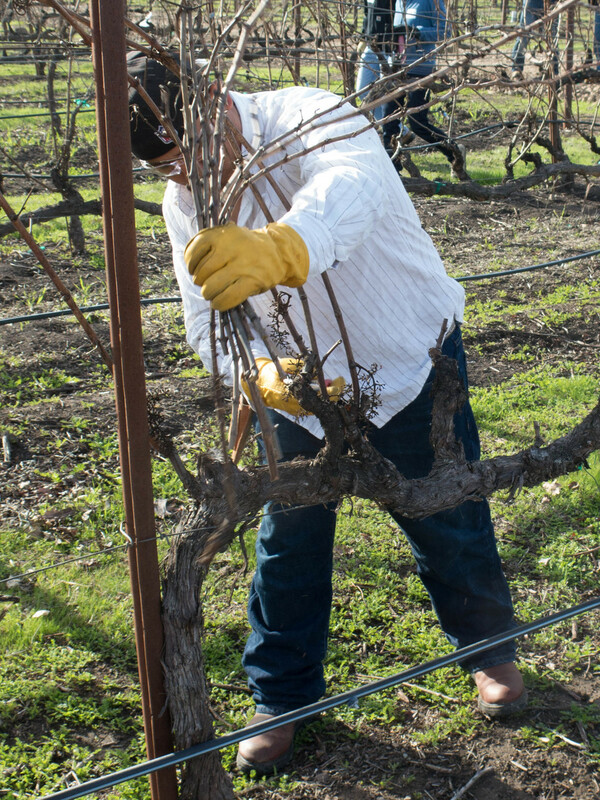 Many consider the final pruning of the vineyard as the most important operation of the year. Pruning introduces additional variables including: labor availability, employee safety, hand pruner’s skill, cost and timing of operations. Walsh is currently experimenting with the use of electronic hand shears to prune a vineyard (see photo below). Shown is an electric pruning shear used by Walsh. This tool significantly lowers the physical impact on employees and helps specifically with cane pruning systems, because the tool facilitates making large cuts in older wood effortlessly. What height the head of a vine is established or the cordon is placed? Pruning can be a risky operation. It is important that vineyard operators educate, train, and research this topic. Your vineyard manager must be an expert, with regards to pruning safety. Cool or warm (hot) climates may affect considerations: cane vs cordon & bud fruitfulness should be considered before final pruning has been done. Finished pruning on the North Coast is more typically done by hand and will not require use of mechanized methods. Significant variables include: manual hand labor cost, labor needed, and skill level required. Ultimately pruning will impact canopy micro-climate, the resulting wine quality, and disease control. Walsh pruners insure that the canopy will have adequate sunlight throughout the canopy; leading to appropriate air circulation and good spray penetration. The average Walsh pruner has been with the company for 10+ years. 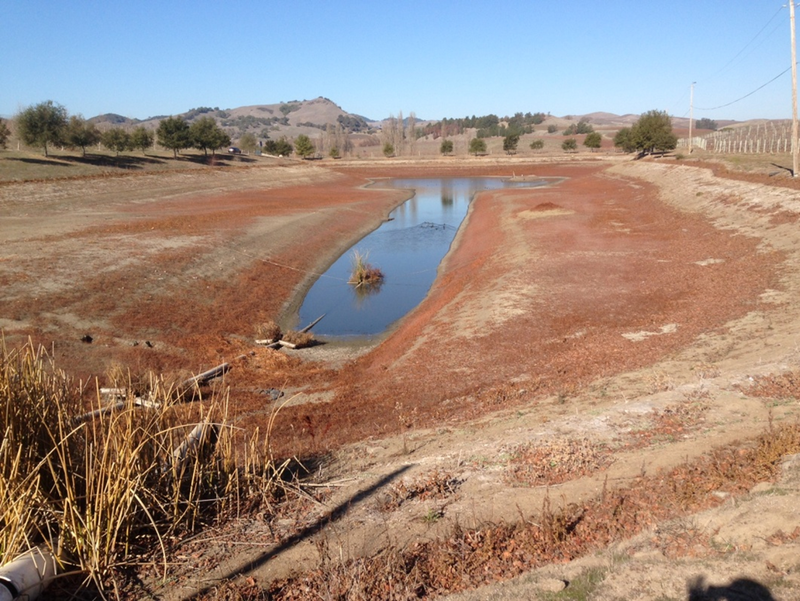 Carneros area pond impacted by 2013/2014 drought. Walsh Vineyards has compiled some area weather data to help our clients quantify their "risk assessment" for the drought conditions in our area. We are currently working with them on management options for the 2014 growing season. This is primarily directed to properties that rely on annual rainfall to fill ponds for use in irrigation. There is a 40% probability of below average rainfall from February through April. We estimate below average rainfall will result in ~7" of rain for the area. There is a 30% probability of normal rainfall from February through April. We estimate average rainfall will result in ~10" of rain for the area. There is a 30% probability of above average rainfall from February through April. We estimate that above average rainfall will result in ~13' inches of rain. 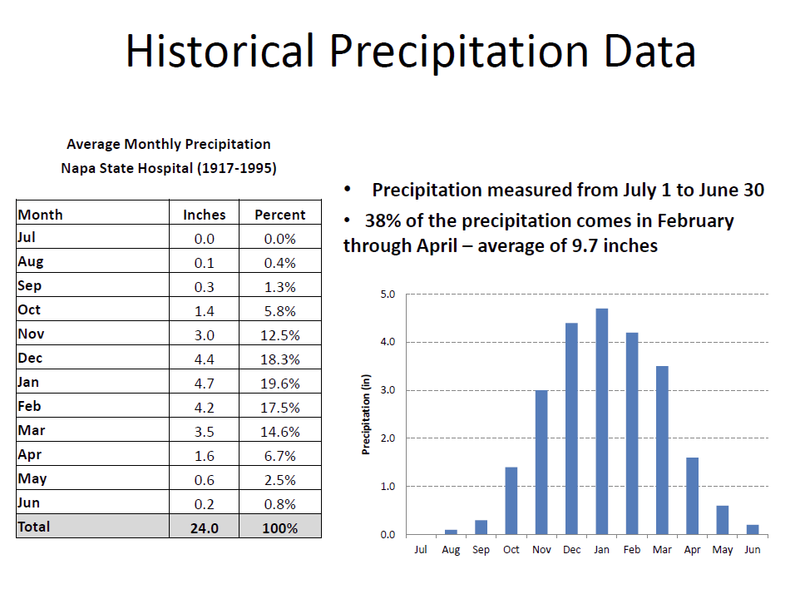 NOTE: This is very generalized, rainfall variation across Napa and Sonoma Valley's are significant. This is very general data that is intended to be a reference point only. 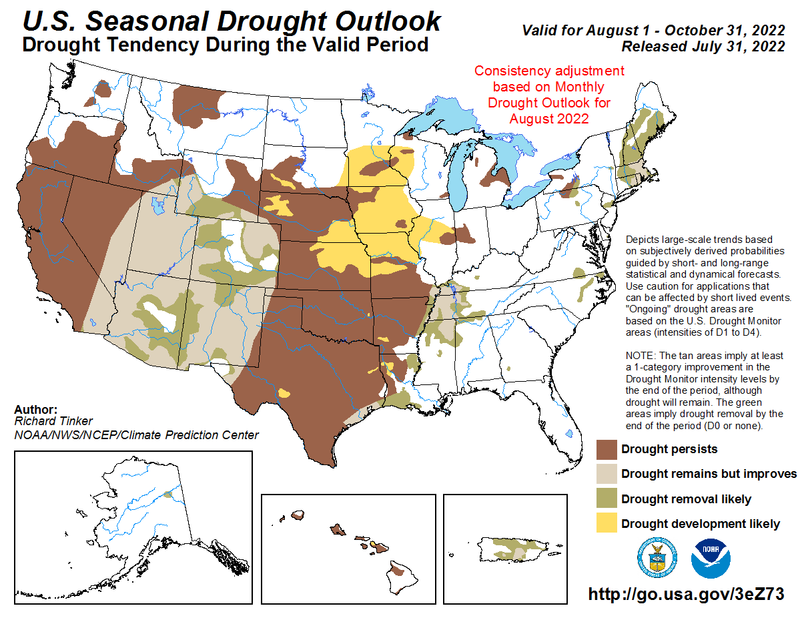 Walsh is working under the assumption that there is an equal to (or greater than) 70% chance of a severe drought. In other words, client properties with ponds only (and no adequate supplemental well) will likely not meet what we consider a "threshold" for their water collection. A common "threshold" of rain that generates available surface water runoff is around 11" of rain. Without 11" of rain, the rain water tends to get "soaked up" into the ground and water therefore does not run into drainage systems to get collected into storage areas. For the same reason, less than 11" of rain also impacts stream water collection efforts, as water flow does not reach adequate C.F.S. (Cubic Feet Second) for pumping water from streams. It is unknown the extent that this impacts subsurface water (wells). Water supply management includes having an understanding of your ponds capacity, modeling of evaporation, potential leakage loss, staff gauge, and known unusable water below the pumping system. Managing vines for water status during every season, and especially this season, is an important tool in maximizing the usefulness of any available vineyard water. Walsh clients utilize various techniques to measure vine water status including: NDVI images, pressure chamber, neutron probe, capacitance probes, shoot tip indexing, historical irrigation records, and weekly scouting. Understand outside sources of water from the City and waste water treatment facilities. For vineyards that are not impacted by the drought, condition systems early and perform bud-break irrigations to insure regular seasonal canopy growth. These are some of the discussions that are currently taking place with our clients, and throughout the valleys. Out clients will continue to monitor what has already become the main management factor in the 2014 vintage. Pre-pruning may be considered as an approach to help control total pruning costs, allow for some disease management by waiting until disease risk is lowest and frost protection by delaying the onset of bud break in the spring. Mechanized pruning considerations could include electronic and pneumatic (hand shears) or tractor mounted implements used to finish or pre-prune a vineyard block. This above unit has rubber tracks that allow for operation in semi-wet soil conditions. Rubber reduces the risk of soil compaction during months that typically include wet conditions. Walsh will preprune 400 +/- acres every year. Reasons for pre-pruning vary: there is some thought of controlling costs, disease and frost control (up to 2 weeks) by allowing for a later finish pruning pass. If vine disease impact is reduced, the effective life of a vineyard may be extended. A grower may choose to pre-prune mechanically or by hand. If by machine, field conditions for access, possible compaction, cost of equipment & R&M are to be considered. Pre-pruning is generally applied to Cordon and not Cane pruned blocks. There may be vineyard infrastructure (negative) impact from cut wires, broken posts and stakes that will need repair following a mechanized pre-prune pass. Some trellis systems and vineyard row spacing will allow for hand pre-pruning only. Typically a pre-pruning machine on the north coast will prune one row at a time. Timing may become an issue depending on the condition of the equipment and skill of the operator. Narrow Vineyard Avenue width and hillsides (<15-17%) will limit the use of a pre-pruner. When incorporating early season pre-pruning as a management strategy, later Season (finished) pruning is possible. This may allow a grower to use less (hand) labor by giving workers additional time to finish a vineyard. Worker safety is always an issue around mechanized operations however hand labor pruning presents additional challenges with workers comp around the strenuous and costly activity of hand pruning. On September 21st, 2013 Napa/Sonoma experienced a much greater total amount of rainfall than the meteorologists were projecting. Originally the reports were for up to 0.10" for the entire event. Surprisingly, the area experienced up to 1.0" of rain. During the early morning of September 21st, we had the first rainfall hit between 1:00am and 3:00am in the morning. This rain was minimal and we expect most of this moisture did not penetrate vine canopies. The mid-morning of September 21st, it rained again around 8:00am. This rain was also minimal and we saw a rewetting of the ground and canopies. It was still insignificant rainfall totals in most areas. In the late-morning between 9:00am-12:00pm we had heavy down-pouring rain. The clusters were soaked and ground was muddy. Totals seen from the Sonoma Valley and Napa Valley were 0.5"-1.0" of rain. Shortly after the last rain fell in the late morning on September 21st, we had sun and wind come into the area. Clusters were dry by Saturday @ 5:00pm as long as they were not in low lying areas (or otherwise wind protected areas). 24 hour cluster wetness was avoided for most areas. Chardonnay and Zinfandel blocks are the most sensitive to rot pressure. Maximum control over rot is achieved through canopy management, with the best results occurring when the canopies are leafed wide open before the event. In highly sensitive areas, Walsh leafed heavily before the rain. Another approach is to spray botrytis materials that prevent rot. Walsh clients elected to do this in only the most sensitive areas. This effect is measurable, but not nearly as effective as opening the canopies. (1) Most clusters did dry out by 5pm Saturday, before the critical 24 hour wetness, that can trigger the Botrytis life cycle. (2) Phenology records indicate we are 120-130 days after bloom. Many blocks still have 10-25 days left to get fully ripe. As a result, grapes still have healthy protective skins, making them less susceptible to rot. (3) The September 21st rain was our first significant moisture of the harvest season. (4) Walsh does not expect rampant Botrytis activity in area vineyards. We will continue to monitor the situation with winemakers. Click the link for a good research paper on botrytis control that supports our discussion on leafing to control botrytis. As of Sunday, NOAA projecting high winds and fire danger by the end of the week. This will dry out any rot and likely lead to a greatly increased rate of ripening. The September heat wave produced many raisins (dehydrated fruit), which will definitely lower yields for most of the remaining blocks. 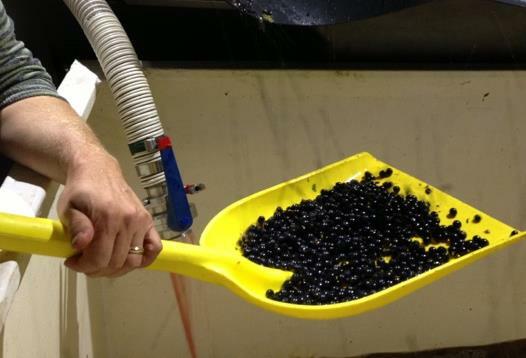 In many cases, Walsh clients are utilizing mobile sorting systems to eliminate these potentially "jammy", "cooked", "baked" or otherwise "unfocused" flavors from their black grapes. 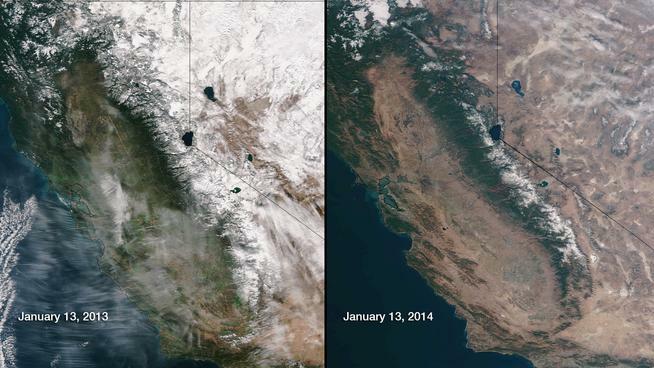 By comparison in 2012, we did not experience much of any dehydration, which lead to the record size crop. Walsh has learned it is much less expensive to remove sunburn and/or dehydrated fruit with high speed optical sorting equipment, when compared to thinning whole clusters in the field. Thinning in the field entails labor costs and growers lose a high percentage of good quality fruit in the process. 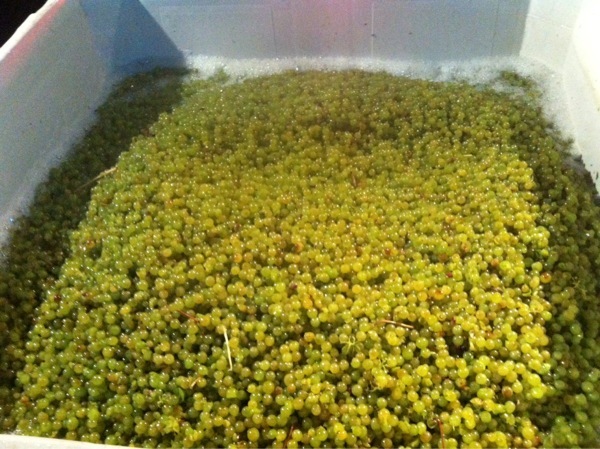 Winemakers often ask if they can keep "dimpled fruit" and "sort out the raisins". Most clients have found that making this distinction is possible with optical sorting equipment. But as good as the sorting equipment works, they are not perfect, and it is better to avoid sun related fruit problems with traditional canopy management. Stand out differences this year are more "pips" and "jacks with grapes still attached". The presence of jacks can impart negative green and/or herbal flavors in the wine. We have attached an example picture of a "jack with grapes still attached". We are seeing more jacks in the fruit fruit this year. Right now the weather is fantastic, with temps in the mid-to-high 80's and partly cloudy. The picking has slowed some as the weather has cooled. Harvesting berry-by-berry with high tech tools has begun in Napa. These tools harvest the fruit and remove MOG (materials other than grapes) to such a high precision that even the most labor intensive alternatives cannot match the quality of fruit delivered to the winery. The team responsible for harvesting the fruit works to calibrate the sorter to winemaker specifications. 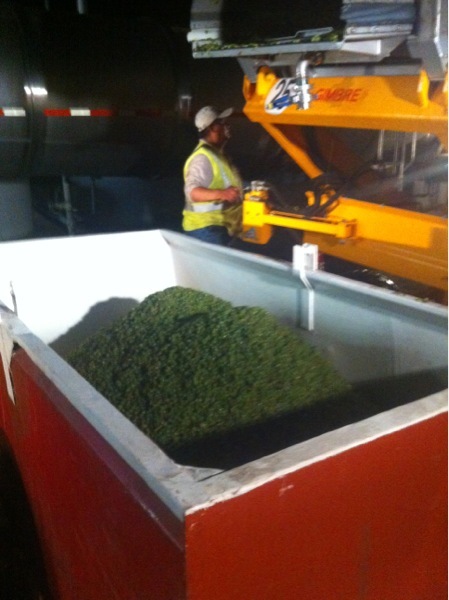 Just last night Walsh team members cluster sorting Gewürztraminer in the Sonoma Valley. Walsh has clients that span a number of different growing regions (Sonoma Valley, Sonoma Coast, Carneros, Napa Valley, Rutherford, Stags Leap, etc). Further, Walsh client properties contain a great many different varieties of cultivars which reach maturity at varying times of the season. This diversity, of region and varieties, results in a prolonged harvest (~75 harvest days) for our crews and equipment. For our clients, that translates into: high quality of operations, reliability, and significant operating efficiencies. Cluster sorting in this video was done to eliminate leaves, Botrytis, and sun affected fruit. Harvest occurred in 44 year old head trained Gewürztraminer at Sonoma's Rhinefarm Vineyard. Free Run Whites "In Field"
Free run white harvesting is an exclusive Walsh offering for early season white wine harvesting with our modern harvesters. This equipment separates the juice in the field and preserves the harvest. Specialized false bottom trailers imported from France ( by Pellenc America) allow us to minimize oxidation and phenolic extraction, both important considerations for quality production. This picture was taken moments ago in the Carneros region of the Napa Valley. Some wineries are embracing high quality mechanization of harvest, approaches that respect the quality of the process and the fruit. Often Dry Ice and KMBS are used to further protect the harvest. When the conditions are correct, results in Chardonnay can be excellent. See photo from tonight's pick.